Fantastic chopsocky from Lee Tso-nam (Eagle’s Claw, The Hot, the Cool and the Vicious), highly regarded in fan circles not only for its sublime action but also its notable story centered on the quest for spiritual (and physical) enlightenment. It can also be read as a study on the contradictory role religion plays in the balance of admonishing evil and the need to show mercy. Similarly to the Christian divide of Catholic and Protestant, the film depicts a violent opposition between Chinese Shaolin monks and a rebel group of Tibetan Buddhists; although the film is never in doubt as to whose side we are on. Chen Shen embodies the rich, vitriolic lamas, given a devilishly aristocratic voice in post-production as he jumps into scenes to attack prominent cast members. He’s an ex-Shaolin disciple who has abandoned his teachings and stolen a sacred kung fu manual, only to now reappear as the leader of his own splinter clan intent on destroying the temple. Alexander Lo plays a wandering fighter in need of direction. 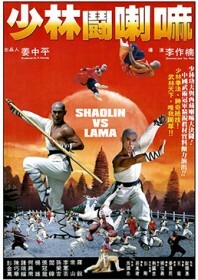 He finds only false prophets before befriending a young monk (William Yen) who smuggles meat and alcohol into Shaolin for his sweary grandmaster (Sun Jung-chi). The grandmaster is uncouth, insubordinate and borderline feral (he appears to live in a tree), but no less devout. He acts as a counterweight to the abbots’ virtuosity and the pomp and ceremony of worship. He is also a master of Shaolin Tiger Fist, and agrees to teach Alexander Lo once the young hero shuns his allegiance to the secular world and all its temptations. He shaves his head and becomes a Buddhist to take on the invading Tibetans. But his greatest struggle is mental rather than physical, and what will prove to be the real winner: vengeance or tolerance? Studio: Tin Ping Film Co.